Just before 7:05 PM on New Year’s Eve, a Toyota Yaris drove out of control off the 10 Freeway and struck a Toyota Solara. The San Bernardino Sheriff’s Department released a statement indicating that five people have lost their lives, including a seven-year-old boy. The deadly crash occurred in Ontario, CA. All four individuals in the Toyota Solara lost their lives. They have been identified as Matthew Pusateri of Mission Viejo and Jeffrey Willey of Huntington Beach – both of whom were just 29 years old. Also killed were 30-year-old Anthony Flores of Hemet and 37-year-old Monica Flores of Arcadia. The seven-year-old boy, Michael Pineda, had been riding in the Toyota Yaris. He was pronounced dead after being taken to a nearby emergency room. The 51-year-old driver of the Toyota Yaris has not been identified. However, she is said to be fully cooperating with the investigators from the California Highway Control. Although the investigation is ongoing, the CHP does not believe that the woman was driving under the influence of alcohol or drugs at the time. Along with the driver, there were two other survivors of the crash. These were a 16-year-old boy and a 12-year-old girl who had been riding in the Toyota Yaris. So far, it is believed that technical malfunctions of the Toyota Yaris may be to blame for the tragic loss of life. Investigators are considering the possibility that the accelerator malfunctioned. A statement from the Sheriff’s Office indicated that the 51-year-old driver was unable to slow or stop the car when it veered onto the Vineyard Avenue off-ramp. When an accident occurs, survivors may have grounds for seeking monetary damages. The first step a lawyer might take is to review evidence to determine the possible causes of the crash and potential liability issues. 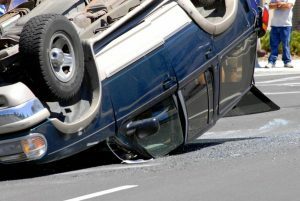 Quite often, car crash survivors can obtain compensation for property damage, medical expenses, lost wages, and other losses from the insurance carrier. However, a personal injury lawsuit may be warranted, which might name the other driver as a defendant. Motorists may be held liable for injuries or death in the event they were driving while distracted, driving recklessly or operating a vehicle while impaired by alcohol or drugs. In some cases, a plaintiff might sue the manufacturer of a car for design or manufacturing defects. Toyota has previously been under fire for “sticky accelerators” and defective floor mats, which led to a recall of millions of vehicles. That problem also resulted in a $1.2 billion fine in 2014 from the U.S. Attorney’s Office after the Department of Justice indicated that the car manufacturer had misled consumers about safety issues. The attorneys at Ellis Law would like to extend our condolences to families who have lost loved ones due to the recklessness and negligence of drivers. We offer the full resources of our law firm to assist victims and their loved ones. Call us today at 310-641-3335 to arrange your free case review with a Los Angeles personal injury lawyer.